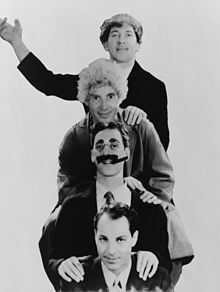 The Marx Brothers were a popular team of sibling comedians who appeared in vaudeville, stage plays, movie, and television. 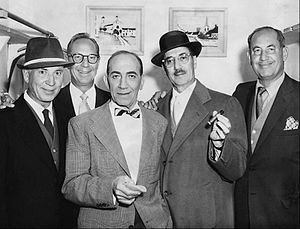 The brothers were Chico, Harpo, Groucho, Gummo and Zeppo. Born in New York City, the Marx Brothers were the sons of Jewish immigrants from Germany. Their mother, Minnie Schönberg, was from Dornum in East Frisia, and their father Simon Marrix (whose name was changed to Sam Marx, and who was nicknamed "Frenchy") was a native of Alsace, now part of France, and worked as a tailor. The family lived in the then-poor Yorkville section of New York City's Upper East Side, between the Irish, German and Italian Quarters. The Marx Brothers began as a musical group, during the days of vaudeville theater. They would make jokes, play funny characters, and pretend to get into fights when they performed. In time their antics got them more applause (and work) than their music, and they became a comedy group. Music stayed in their act, with the brothers performing in character, but their focus was on getting laughs. Makeup and costumes gave their characters their look. When the brothers were out of costume, they could blend into the audience. Gummo did not appear in any of the movies. In the movies, each brother played a role that was mostly the same in every movie. Groucho was a "wise guy" who had big bushy eyebrows, glasses, and a moustache who smoked a cigar; Chico spoke with an Italian accent and played the piano; Harpo never spoke and played the harp. Zeppo usually played the straight man. He left the group in 1933, and they worked with other actors. Margaret Dumont played the leading lady role in many of their shows. She did not appear to know when a joke was made about her, and this made her role funnier. Groucho kept working after his brothers retired. He hosted a television quiz show called You Bet Your Life, which was more liked for Groucho's way of hosting than for the game itself. He made a few movie and television appearances late in his life. He also appeared at Carnegie Hall, telling stories about his life and career, and singing songs from every part of his career. A recording of his Carnegie Hall show became a best-seller. This page was last changed on 30 September 2018, at 19:16.